The other day, my son asked me what my favorite food is. He was on a mission. He was curious about what my favorite things are: color, car, animal, not because of a deep desire to better understand the things his mom is passionate about, but to try and hack into my computer account. I caught on quickly, and informed him he was very much off base and commended him for his effort. However, I was not able to answer the favorite food question. Being a person who loves to cook and to eat, I have so many foods that I adore. I can’t pick just one thing (no, not even bacon! ), though there are definitely tastes that I love such as lemon, garlic, strong herbs like rosemary and cilantro, and the spicy flavors of regional and ethnic foods like Cajun, Caribbean, Mexican and Indian. Even though I can’t name one food that is my absolute favorite, I do have several weaknesses…foods that I just can’t say no to. Two of my biggest weaknesses, bread and cheese. This simple recipe includes both a crusty bread and soft cheese, as well as garlic and fresh herbs. 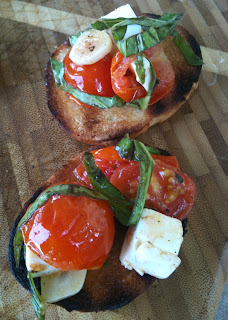 It is quick and easy, and is a versatile appetizer or just a tasty snack. Bruschetta is an Italian antipasto made from toasted bread rubbed with garlic and drizzled with olive oil. The bread can be topped with roasted peppers, tomatoes, cured meats like chorizo, salami or pepperoni and cheeses. The popular Americanized version of Bruschetta is topped with tomatoes, garlic and basil with mozzarella cheese. Like so many foods, this recipe is even better when prepared on the grill. 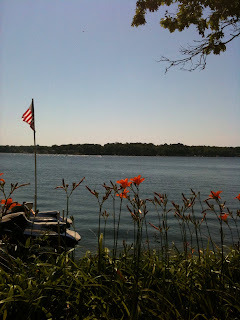 This Father’s Day weekend, I’m blogging from one of my dad’s favorite places: our family lake cottage. Being at the lake offers a few challenges to food prep, mostly because I’m not in my own kitchen with my tools. I even forgot to toss my favorite knife into the supply bag with the rest of my ingredients. If you ever used a knife at our lake place, you would understand why that’s a big deal. Most of the knives are probably antiques and can barely cut through soft butter, but I found the sharpest one and made it work. The other catastrophe this trip was that my favorite olive oil fell over in the back of the car during the trip and leaked out of the bottle. My husband’s reaction: “oh man, the truck carpet!” My reaction: “oh man, my olive oil!” Priorities, right!?! 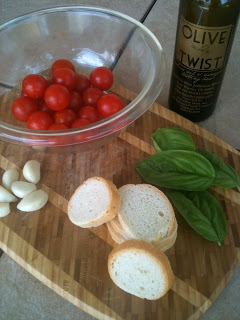 Thankfully, I still had enough to cook with, but I will be making a trip to The Olive Twist this week to stock up! 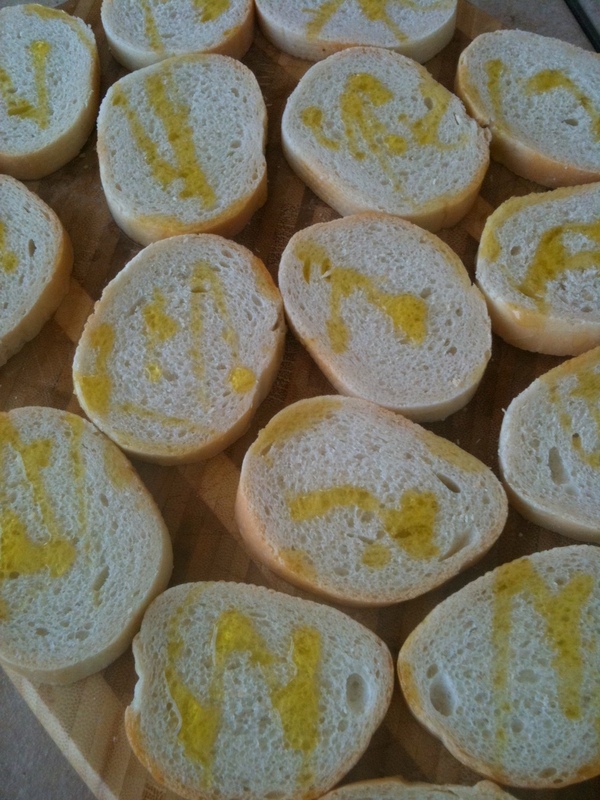 *I saved myself a step and used Garlic Infused Olive Oil, so I didn’t rub the bread with the garlic. Wash tomatoes and slice in half. Peel garlic and slice thin. Roll the Basil leaves to make them easier to slice. 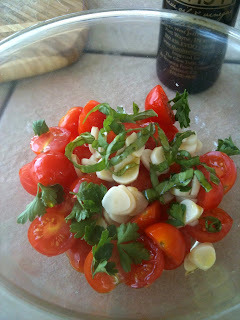 Place the tomatoes, garlic slices, parsley and 1/2 of the basil in a bowl. Drizzle with olive oil. Salt and pepper. Toss together. Preheat grill and grill pan. Rub bread with garlic clove. 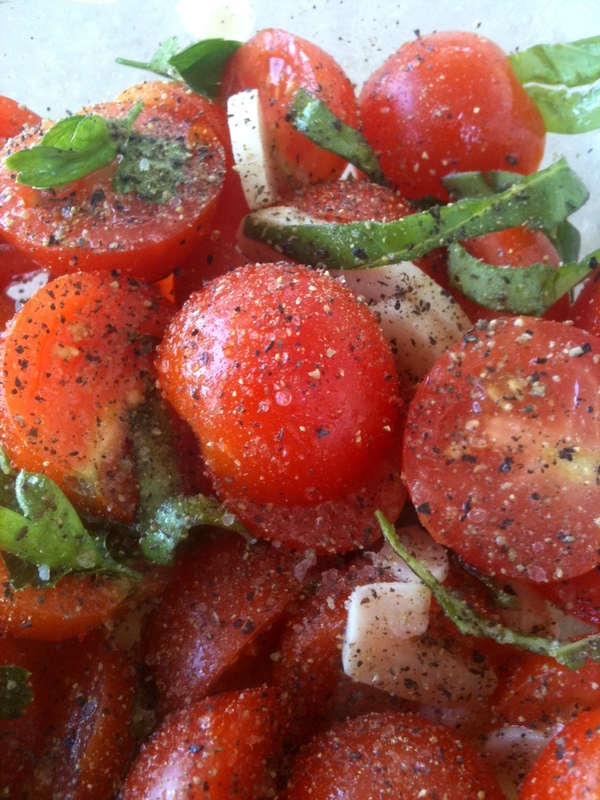 Drizzle olive oil on both sides. Reduce the grill to medium-low. Pour the tomato mixture on the grill pan. Gently toss as the bread toasts. Lay the bread directly on the grill rack to toast. Check frequently to be sure not to burn the toasts. Move the pieces around the grill and flip over as necessary. 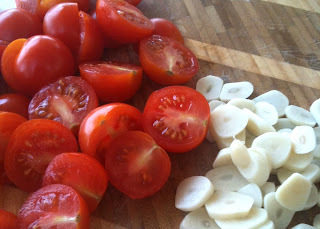 When the tomatoes start to “burst” and the garlic is lightly browned, remove from the grill and put back into the bowl. Be cautious not to overcook the garlic as it can become bitter. 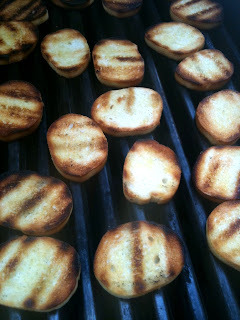 Remove the toast when a deep golden brown on both sides. 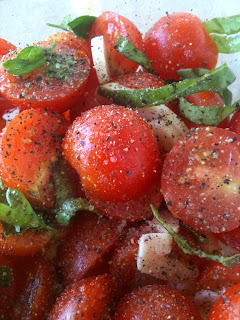 Allow the tomato mixture to cool slightly before adding cheese. Cut the fresh Mozzarella into small pieces (about half the size of the tomatoes). 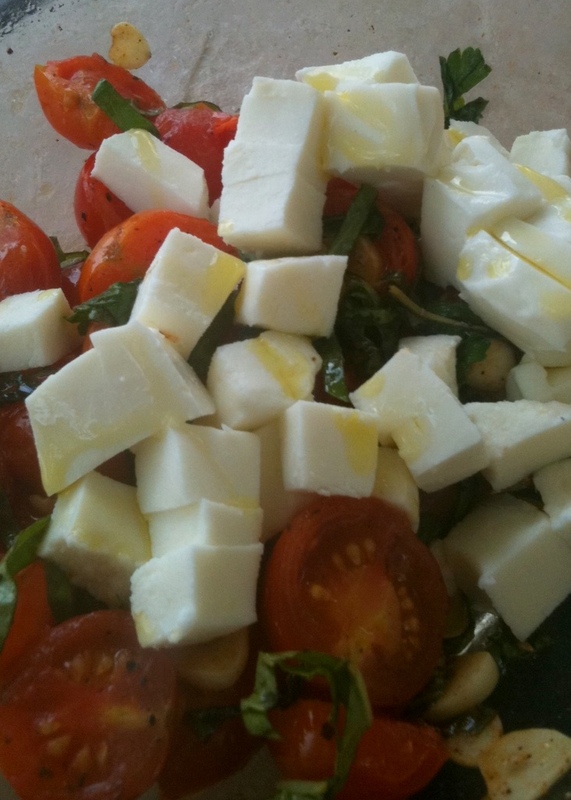 Add the cheese, the remainder of the basil and another generous drizzle of olive oil to the bowl and gently toss. Spoon onto the toasts. 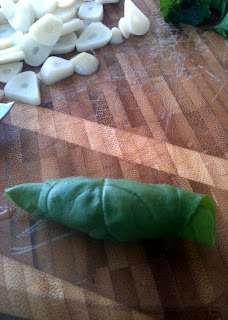 Garnish the serving plate with whole basil leaves. When you bite into these tasty treats, the tomatoes will pop in your mouth and the juices and olive oil will run down your hands, so have napkins nearby! Warm weather has everyone wanting to avoid heating up the kitchen, grabbing the tongs and heading outside to fire up the grill! 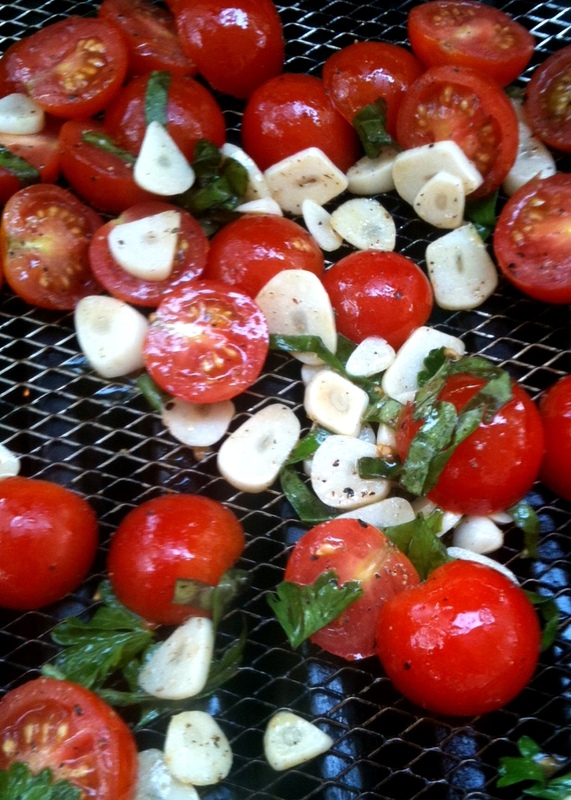 There are many, many foods that can be prepared on the grill and often are tastier cooked over fire. And most of those become absolute taste bud paradise when topped with butter! Herb butter is made by combining any herb or spice with butter. Fresh herbs, freeze dried herbs or dried herbs (spices) all work well. My only rule (note: I didn’t say recommendation, I said rule! ), is that REAL butter be used. Whether you use salted or unsalted is your preference, but I will send a bolt of lightening to shock some sense into you if you use the fake stuff. Okay, I realize that I don’t actually have those powers, but don’t tell my children…wink, wink! In our house, you will find only real butter and you will find it on the counter. To refrigerate or not to refrigerate…one of the key debates in the food world. Not surprisingly, the USDA says to keep butter refrigerated until about 10-15 minutes before use to be safest. However, many people will insist that butter can be kept on the counter, covered, for a week or more. Butter is made from pasteurized milk which helps to keep bacteria growth low, as does added salt. 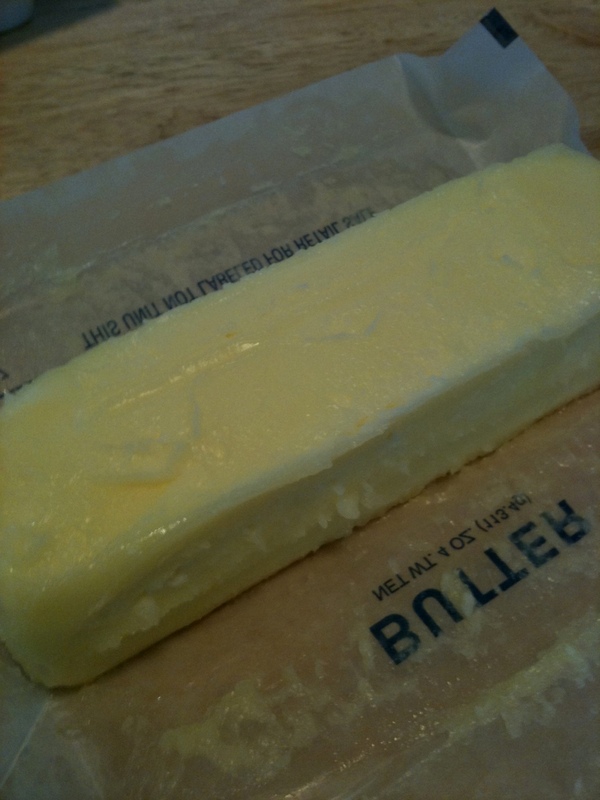 Typically, the butter will be eaten before it has a chance to spoil or become rancid. To make herb butter, set the butter out long enough to soften. You don’t want to use the microwave because you risk melting it and causing it to separate. I made three types of herb butter to have ready for upcoming recipes: Rosemary Butter, Chive Butter and Dill Butter. Rosemary is a hearty herb with a pungent, woodsy flavor and like Cilantro, it is an herb that people either really like or don’t like at all. 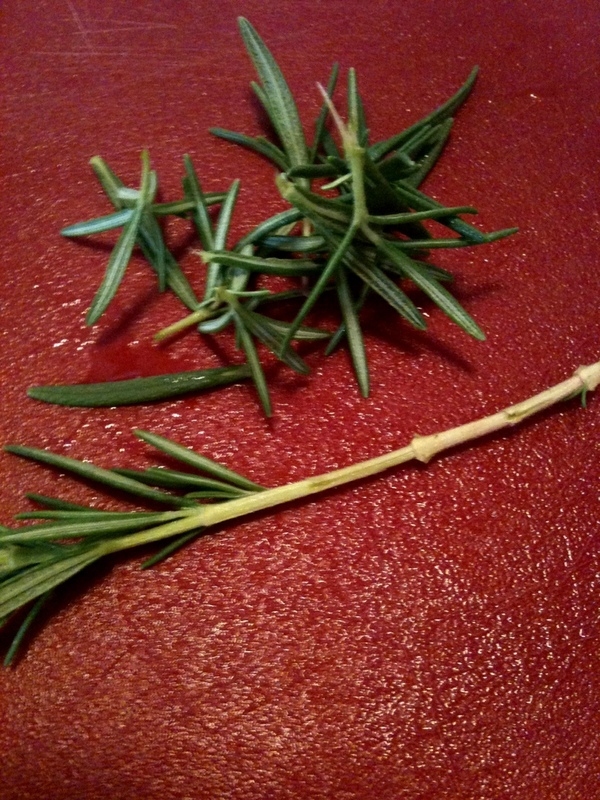 Rosemary can overpower other flavors if used too heavily. It is a compliment to strong flavors like garlic. It pairs well with steaks and with rich meats such as lamb, duck and game, and with vegetables such as zucchini and eggplant. It also goes well with sharper flavored cheeses such as Bleus. I plan to use it to top a garlic marinated steak, cooked to a warm, pink, juicy medium rare along with some crumbled Gorgonzola. I chose to use fresh Rosemary for this recipe for two reasons: first, I have it readily available in my herb garden and second, though dried Rosemary has a similar flavor, it has a rough texture and doesn’t really soften, even in cooking. 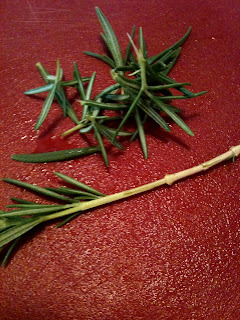 To remove the Rosemary from the stem, simply hold the top of the stem between two fingers and using the other hand, pinch and pull down. You can reserve the stems to use as shish kabob skewers. In fact, skewering some fresh zucchini, mushrooms and onions, and grilling them along with the steaks would be a great side dish. Because I wanted a very fine chop, I put the Rosemary in my spice grinder and pulsed it a few times. 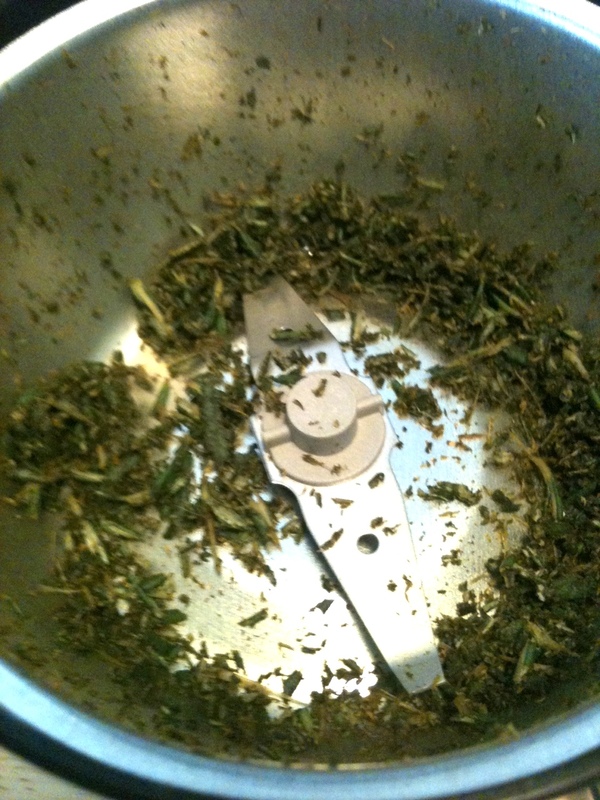 Clean the grinder immediately because the potent oils can make all the spices you grind taste like Rosemary. I have found that pouring coffee beans into the grinder and letting them sit for a day or so helps to remove spice scents from the grinder. 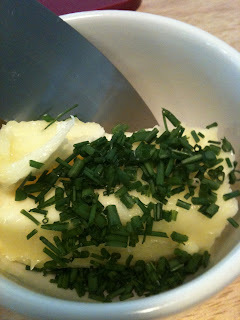 Mix the herbs into the butter. 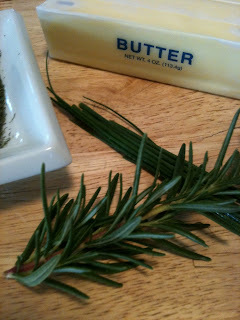 I use a heaping tablespoon of herb to one stick (1/2 C) of softened butter. The amount can vary depending upon the herb and your taste. 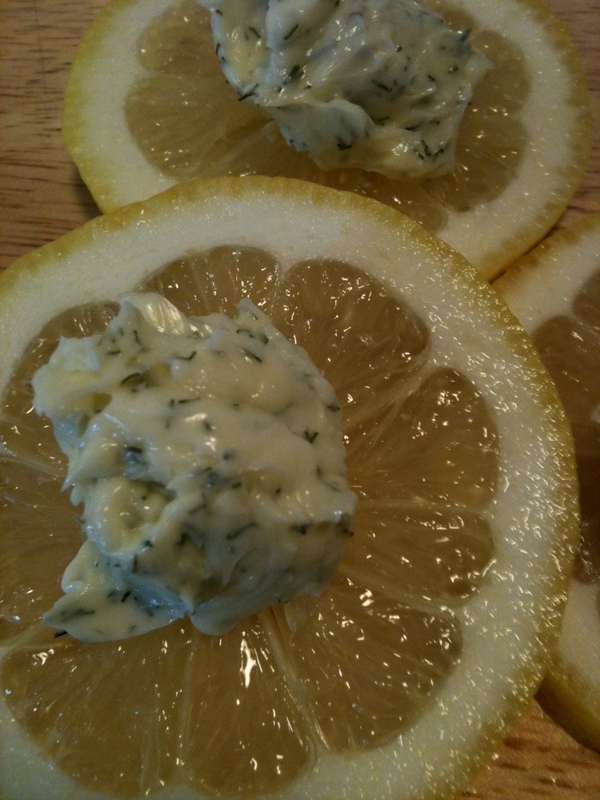 Herb butter can be stored in the refrigerator in a container or serving dish, or it can be formed into shapes for attractive presentation. I put the Rosemary Butter in the refrigerator for a few minutes to begin to chill it, and then rolled it into balls. I placed the balls into the freezer while I prepared the remaining butters and then transferred them to a zipping bag to store in the refrigerator until steak day. When the steaks are ready to be plated, I will sprinkle some crumbled Gorgonzola on top and then place a ball of Rosemary Butter on it. It’s all about the presentation, right!??! The leaves and the seeds of Dill can be used in cooking. The seeds are used in pickling spice. The leaves, often referred to as Dill Weed, pair well with white sauces, soft cheeses, seafood, chicken and egg dishes. It is also tasty in salads and with vegetables. Because it is very fine, Dill should be added at the end of cooking so that it’s flavor isn’t tempered. The Dill Butter I made is going to be used for two purposes: to flavor steamed or grilled vegetables and to top grilled fish filets. 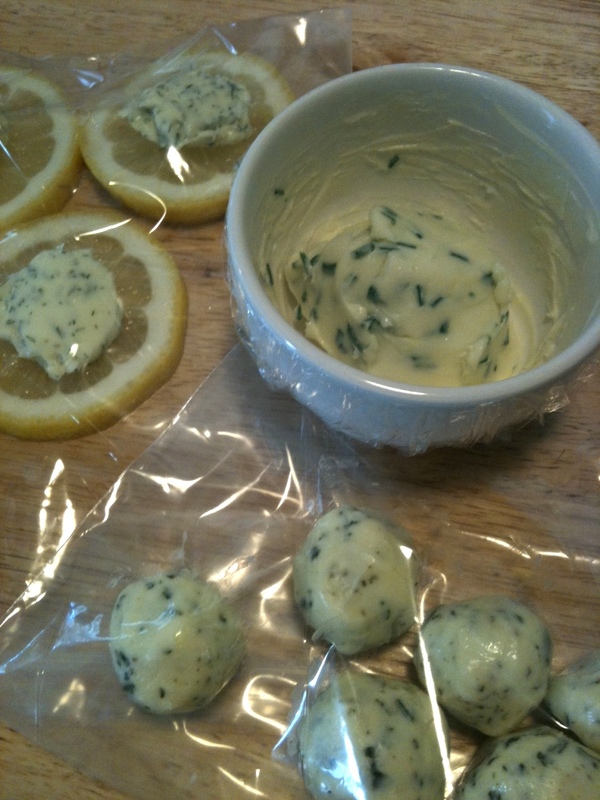 After mixing the Dill and butter, I placed a dollop on top of a lemon slice and store in the refrigerator or freezer until I’m ready to use it as a flavorful garnish for fish. 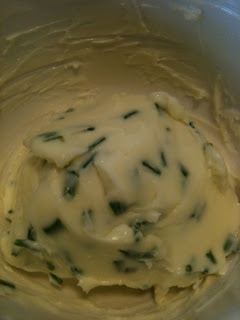 The final herb butter I made was Chive Butter. Chives are part of the Garlic and Onion family. Chives have a flavor similar to green onions and go well with salads, vegetables and potatoes, egg dishes and with cream cheeses. 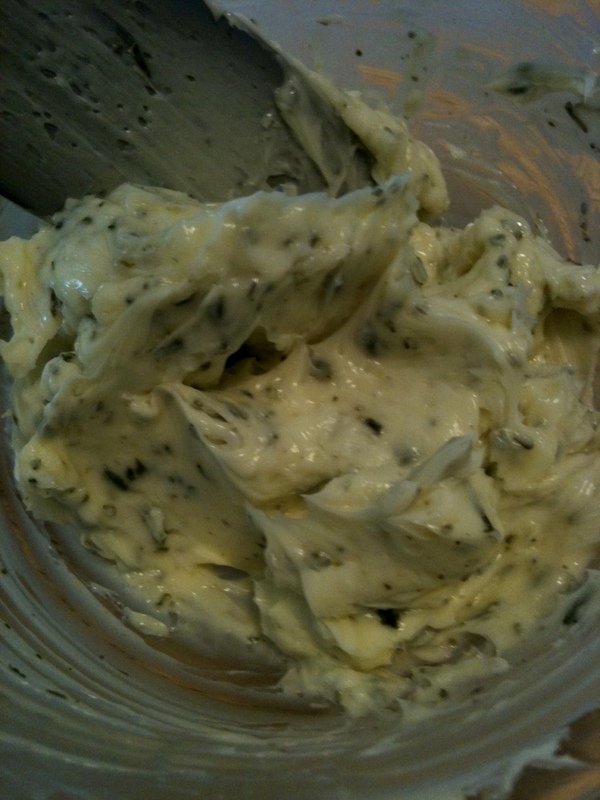 The Chive Butter I made will be used for flavoring new (red) and fingerling potatoes, and steamed vegetables. Sometimes, I just spread it on crackers as a snack. 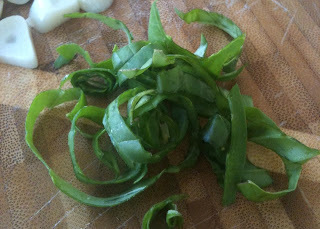 Chives are easier to snip with kitchen shears than to chop. Cut them right over the bowl of softened butter and then mix together. I started this blog because I love to cook and have a passion for fresh herbs and spices, and because I like to share recipes and tips with others. It is easy for me to talk about food and to create or adapt recipes. What I have found to be the most difficult part of blogging is thinking of creative titles to capture the attention of readers. So, I have to give credit to my 9 year old son for the title of this blog. When I mentioned to him that I was struggling, it took all of five seconds for him to say, “how about buttering them up?” Perfect!